The following Historia Incognita books are available for purchase at the retailers indicated, as well as many others. Although most books have two ISBN numbers, the books are identical – one is for sale through Blurb, the other is for sale through other online retailers. Compare prices first – they vary greatly between retailers. Click on the book cover to read more about that book. 1849: The Rush That Never Started (ISBN: 9781320575751) can also be purchased from Amazon USA; or Amazon UK; Wheelers (Aust); Readings (Aust); The Book Depository (UK); and other online retailers. 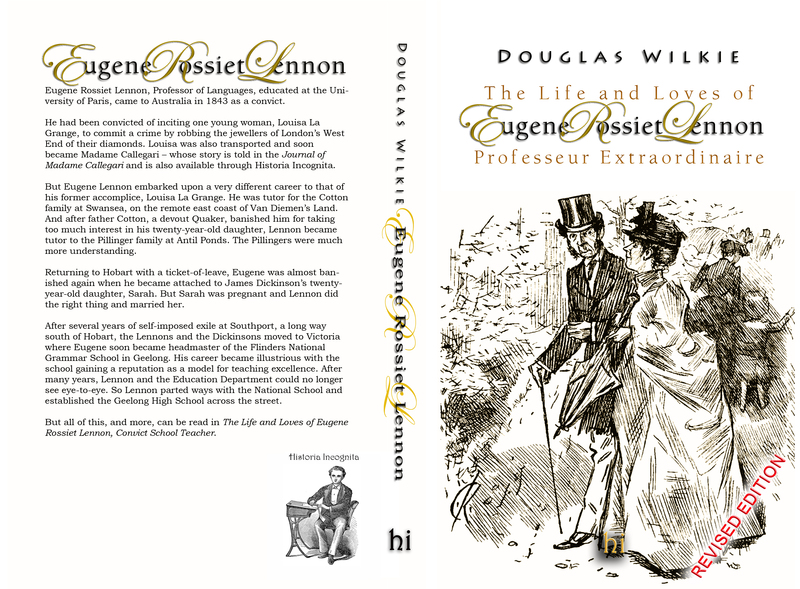 The first edition of The Life and Loves of Eugene Rossiet Lennon (ISBN: 9781320370783) has been replaced by a Revised Edition (ISBN: 9781364660642) correcting several minor typographical errors. Otherwise the text is identical. The Revised Edition is available here, and is also available through the Global Retail Network (Amazon (US), Amazon (UK), Book Depository, Barnes & Noble, Readings, Wheelers, Booktopia, Angus & Robertson, etc) with ISBN: 9781367601499. The Sink of Iniquity (ISBN: 9781320618793) is also available for purchase through The Book Depository; Amazon; Barnes & Noble; Readings ; AbeBooks; Booktopia; and other outlets. Duchene/Hargraves (ISBN: 9781366781116) can be purchased here for $25AU plus postage. Duchene/Hargraves (ISBN: 9781367097360) (both editions are identical) is also available through major online retailers such as Book Depository, Booktopia, Wheelers, Barnes & Noble, Amazon (UK) and Amazon (US) – but compare the variation in prices first. Retail Distribution and Prices: There are usually two versions of each book – one for distribution directly through the Blurb web site, and one for distribution through Ingrams Global Retail Network, which includes outlets such as The Book Depository, Readings and Amazon. There is no difference between the books apart from the ISBN – and possibly the price. At the time of first publication the price of each version was set so as to be almost identical. However, individual retailers may raise or lower their price from time to time, and may, or may not, add shipping costs. Because of this variation it is worth checking the current price offered by different retailers against the price through Blurb. Books sold through the Global Retail Network return a much smaller royalty to the author because the Retailer’s profit is greater. The choice is yours. Libraries and other institutional purchasers might check suppliers such as Wheelers Booksellers (Aus), Wheelers (NZ), or contact Historia Incognita .